Fort Wayne, IN (July 18, 2017)—Leaders from the Mad Anthonys Children’s Foundation presented officials from the Mad Anthonys Children’s Hope House with a check for $150,000 raised through the 2017 Red Coat Dinner and Charity Golf Classic for Children, which were held June 23-24. 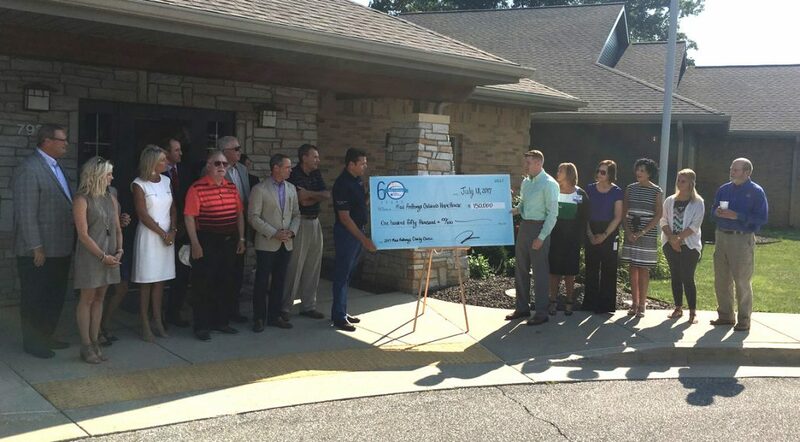 Officials with Mad Anthonys presented the check at an event Tuesday morning at the Children’s Hope House on the campus of Lutheran Hospital. This year’s donation of $150,000 to the Hope House brings the cumulative total donated by the Children’s Foundation to more than $2 million in the 10 years since it began its partnership. The 2017 Red Coat Dinner and 2017 Mad Anthonys Charity Classic for Children took place June 23 and 24, respectfully, and honored State Senator David Long and the Fort Wayne Komets’ six-man ownership team – brothers Stephen, Michael, Richard, David and William Franke; as well as Scott Sproat – as 2017 Red Coat recipients.